Where did dogs first arrive on the scene? 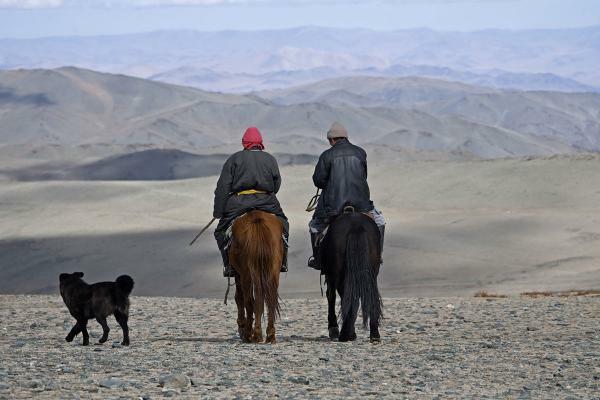 Scientists have long debated that question, and now a study of doggie DNA from around the world is pointing to Central Asia. Man's best friend may have evolved somewhere near what is now Nepal and Mongolia, researchers say. Previous studies have suggested southern China, the Middle East, Siberia and Europe as the place where our first domesticated animal arose from wolves at least 15,000 years ago. For the new work, Adam Boyko of Cornell University and others analyzed DNA from 549 dogs that represented 38 countries in Africa, the Americas, Asia, Europe, India, the Middle East and islands north and east of Australia. The animals weren't house pets, but rather "village dogs" that wandered freely in the streets or fields. The researchers examined the DNA for signals of where the dogs had the most ancient roots. That pointed to Central Asia. The analysis did not tackle the contentious question of when dogs appeared. Results were reported in a paper released Monday by the journal Proceedings of the National Academy of Sciences. Even Boyko doesn't think the work will end the debate among scientists. "I'm not pretending my study alone is enough to rally the community together," he said. He's right. Robert Wayne of the University of California, Los Angeles, who proposed a European origin for dogs in 2013 based on analysis of ancient DNA, said he didn't buy the conclusion about Central Asia. In an email, he questioned Boyko's use of modern-day genetic material as a guide to the distant past. Another expert, Greger Larson of Oxford University, called the paper "a major step forward" but said he also suspected that modern DNA isn't the way to go. Now that Central Asia has been added to the mix, "Everyone with a favorite region can point to at least one paper that supports their suspicions," Larson wrote in an email. Larson is involved in an international project to tackle the question with ancient DNA and anatomical comparisons. Boyko said that research will provide an important test of his own work.